A CONVERSE LIMITED EDITION sneaker that is a ‘must have’ for your wardrobe. 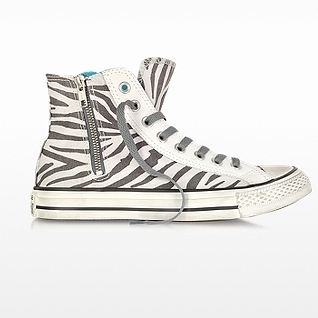 All Star High-top Animal Printed Canvas Zip Sneaker is crafted in Zebra print cotton canvas with leather accents along eyelets. Featuring lace up closure, outer zip closure, All Star patch at ankle , rubber sole and toe cap with classic black stripe accent. Reinforced eyelets. Signature box included.